Saving your life can be as easy as turning your car around when you see water on the road. However, as we have experienced in Gauteng this past week, when the rain comes down in buckets, water levels can rise extremely quickly. Even in relatively shallow water, tyres can act as flotation devices - lifting up even big vehicles and sending them downstream. It can take just 60 cm of moving water to move a vehicle and carry it away – even if you are in an SUV! Despite your best efforts, you could find yourself in a flash flood situation. 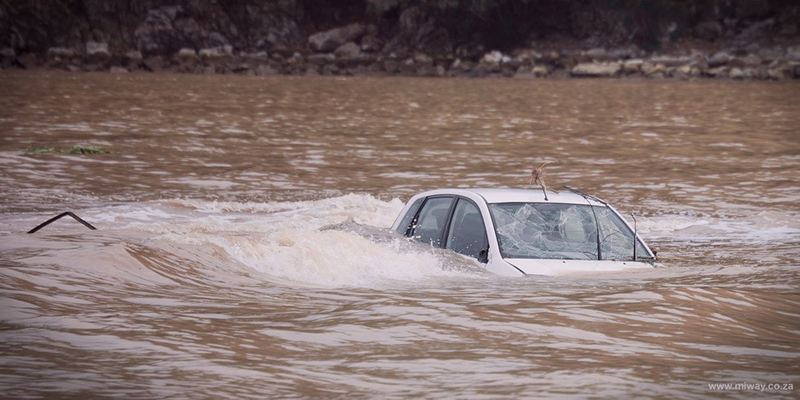 How do you survive if you are caught in a flash flood situation whilst you’re in your car? Try and stay calm - do not panic! Once you start panicking, you won’t be able to focus and chances are good that you will make the wrong decision. You and your passengers need to focus on one goal only and that is “to exit the car as quickly as possible”. Unbuckle: Releasing your seat belt will allow greater freedom of movement. Be aware that the seatbelts might not retract; take care not to get tangled in the belt! Get out! If you can’t open the doors because of the water pressure against them, roll down your windows. If your electronic windows fail to open, use the metal part of your removeable head rests to break the windows – or any other steel-tipped tool. Alternatively, try kicking out the windscreen. If your windows won't open, and you've exhausted all alternatives, let the car fill with water and then attempt to open a door. Yes, it sounds counter-intuitive, but once the internal pressure is equal to the outside pressure, you will be able to open the door more easily. Experts recommend choosing a door on the side away from the water flow, as it's much easier to open a door where there is less pressure - and the chances that an obstacle may be blocking the door are less. Get out of the car immediately, hold your breath and swim to the surface and get to higher ground as soon as you can. Do not stay in the car until it sinks. If you are swept into fast moving floodwater outside of your car, point your feet downstream. If you strike any objects it's better to do it with your feet rather than your upper body, your torso, or your head where you can be knocked unconscious. Make yourself as light as possible by, for instance, kicking off heavy boots. It may seem obvious - but don't try to save your personal possessions, i.e. computers, phones, purses, jewellery, etc. which can be replaced - your life can't! It is important to acknowledge that not all experts agree on all the survival tips and the precise sequence of escape - but the above tips are some common threads that need to be identified and learnt from. Besides avoiding getting into a flash flood situation altogether, the best course of action is to try and get out of your car as soon as possible.